And when he came to the other side, to the country of the Gadarenes, two demon-possessed men met him, coming out of the tombs, so fierce that no one could pass that way. And behold, they cried out, "What have you to do with us, O Son of God? Have you come here to torment us before the time?" Now a herd of pigs was feeding at some distance from them. And the demons begged him, saying, "If you cast us out, send us away into the herd of pigs." And he said to them, "Go!" So they came out and went into the pigs, and behold, the whole herd rushed down the steep bank into the sea and drowned in the waters. The herdsmen fled, and going into the city they told everything, especially what had happened to the demon-possessed men. And behold, all the city came out to meet Jesus, and when they say him, they begged him to leave their region. They came to the other side of the sea, to the country of the Gerasenes. And when Jesus had stepped out of the boat, immediately there met him out of the tombs a man with an unclean spirit. He lived among the tombs. And no one could bind him anymore, not even with a chain, for he had often been bound with shackles and chains, but he wrenched the chains apart, and he broke the shackles in pieces. No one had the strength to subdue him. Night and day among the tombs and on the mountains he was always crying out and cutting himself with stones. And when he saw Jesus from afar, he ran and fell down before him. And crying out with a loud voice, he said, “What have you to do with me, Jesus, Son of the Most High God? I adjure you by God, do not torment me.” For he was saying to him, “Come out of the man, you unclean spirit!” And Jesus asked him, “What is your name?” He replied, “My name is Legion, for we are many.” And he begged him earnestly not to send them out of the country. Now a great herd of pigs was feeding there on the hillside, and they begged him, saying, “Send us to the pigs; let us enter them.” So he gave them permission. And the unclean spirits came out and entered the pigs; and the herd, numbering about two thousand, rushed down the steep bank into the sea and drowned in the sea. The herdsmen fled and told it in the city and in the country. And people came to see what it was that had happened. And they came to Jesus and saw the demon-possessed man, the one who had had the legion, sitting there, clothed and in his right mind, and they were afraid. And those who had seen it described to them what had happened to the demon-possessed man and to the pigs. And they began to beg Jesus to depart from their region. As he was getting into the boat, the man who had been possessed with demons begged him that he might be with him. And he did not permit him but said to him, “Go home to your friends and tell them how much the Lord has done for you, and how he has had mercy on you.” And he went away and began to proclaim in the Decapolis how much Jesus had done for him, and everyone marveled. 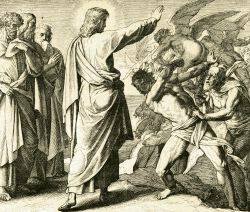 In Matthew's account the demons beg Jesus to cast them into the herd of pigs, whereas in Mark's account two things occur: the man (possessed by demons) speaks his mind and the demons (who currently possess the man, i.e. "Legion") speak their mind. Notice carefully that in Mark's account, the man is first to do the begging. He begs Jesus not to send the demons out of the country. Perhaps that was because he understood the dangerous and volatile influence of "Legion" and he wanted to protect the people out in the country. But also notice carefully that immediately after the man speaks his mind, Legion speaks to Jesus, begging him to send them into the herd of pigs. This is a startling difference between Mark and Matthew, and it's an important factor for understanding the main point of Matthew's story. Also, in Mark's story, there is a surprisingly large amount of dialog between Jesus and the man, including dialog before and after Jesus casts the demons out of him. But in Matthew's story, Jesus only says one word. There is no further dialog from Jesus in Matthew's account. In Matthew's account, not only is the presence of Jesus enough to torment demons, but only one word is enough to cause them to flee from his presence. This uniquely short amount of dialog, I believe, is another important factor of Matthew's story, and is also crucial for understanding his main point. In fact, it is this uniquely short amount of dialog which helps distinguish between those who engage in dialog with Jesus and those who don't, which may, in fact, be the most important factor of this story. Further evidence points to Matthew's emphasis upon the demons and not the man (or men). Not only is there no distinction between those who speak as men and those who speak as demonic-oppressors, but this seems to harmonize well with Mark and Luke, who only mention the man (singular) possessed with many demons (plural). Moreover, when compared side-by-side with Mark and Luke, Matthew's story is clearly focused upon something other than the individual man. For example, in Luke's account, there are twenty six references to the individual man possessed with demons, and in Mark's account there are thirty four references to the individual man. But in Matthew's account, there are zero references to the individual man or even "men." All of this information leads me to believe that here, in this passage, Matthew's emphasis is upon Jesus' confrontation with demons, not a man (or men). This might be why the NRSV translates Matthew 8:28-34 with the word "demoniacs" instead of "demon-possessed men." Matthew is describing an encounter between Jesus and demons. But there is more which can be gleaned from a side-by-side comparison of Matthew and Mark. In Mark’s account, this story is bound together in six distinctive sections, whereas in Matthew's account this story is bound together with three distinctive sections paralleling two emphatic “begging’s." A) "Behold!" Son of God! Why have you come to torment us before the time? Center: Jesus says “Go!” and then "Behold!" The whole herd is rushing down into the lake to drown! After Jesus descends the Mount in chapter seven of Matthew's gospel, we find a series of wondrous stories -- true stories -- about Jesus healing and restoring his creation (e.g. the leper, the centurion's servant, Peter's mother-in-law, the stormy sea), all of which portray two common themes: 1) the authority of Jesus, testified by miracles and 2) the faith of all creation, testified by obedience to his word. Here in the midst of those wondrous stories, we learn another important lesson about authority and faith. In Matthew's story, Jesus reaches the destination to which his Heavenly Father has called him. He reaches "the other side" of the Sea of Galilee, a Gentile city filled with herds of unclean pigs and fierce demonic-oppressors who lurk in unclean tombs. But all it takes is the presence of Jesus to get them flustered. They believe that Jesus is the "Son of God" and they also believe a time of judgment awaits them, which is why they poke and prod Jesus with questions. Matthew's story is not about the faith of a man (or men) at all. Matthew's story is about the faith of demons who believe in God and tremble. They believe Jesus has authority over them, which is why they beg him, saying "If you cast us out, send us away into the herd of pigs." They beg Jesus for permission to flee from his presence because they have faith in his authority over them. But that's not all. By the end of this story, the faith of the people in this unclean Gentile city is analogous with the faith of these unclean demons (note the parallels of Matthew's literary structure: A, B, Center, A', B'). The demons don’t want Jesus to meddle with them, and the people don’t want Jesus to meddle with them. The demons don’t want to be anywhere near Jesus and neither do the people of the city. But Jesus has not come to meddle. Jesus has come to confront the demonic-oppressed faith of an unclean city. Jesus has come before the time of final judgment to show them what their final destination will be like if their faith is shaken by his mere presence. When the people beg Jesus to flee, their unclean city is sure to become the destiny of the demonic-oppressors. All who maintain that kind of faith -- a faith which rejects the Son of God -- will be cast out as unclean, and will rush headlong into destruction. 1. This is clearly distinguishable from Matthew's use of the same word later in 9:32, which explicitly describes a "demon-oppressed man" (anthropon daimonizomenon). However, in the text before us, there is no word for "men" (anthropous) to be found anywhere. The emphasis rests entirely upon the demonic influence which is possessing, not the possessed.